Gold and gold mining shares spent most of the third quarter backing and filling without establishing any clear direction. Gold increased 7.6% during the quarter, closing at $1328.6/oz, but down 20.7% year-to- date. The XAU Index of gold and silver stocks rose 4.1% during the quarter, and was down 42.5% on a year- to-date basis. The rationale for investing in the precious metals sector remains compelling, in our opinion. That rationale rests on two fundamental pillars. Firstly, world-wide fiscal and monetary policies have been directly and indirectly subsidizing asset values, which makes financial assets especially vulnerable to permanent impairment when supports inevitably end. Secondly, continuous and unconstrained monetary emissions are fraught with unintended consequences, which have historically included debasement of paper currencies via inflation or devaluation and sovereign debt crises. These risks can imperil all financial assets both in terms of their market prices and solvency. It is astonishing to us that the Federal Reserve and its radical monetary policy retain even a sliver of credibility and trust within the financial markets. Third quarter commentary by various prominent Fed officials conveyed no consensus for attaining their prime objective of slowing the rate of asset purchases and thereafter reducing the size of the Fed balance sheet. The Fed decision not to taper following the FOMC meeting in September momentarily surprised the markets, leading to a brief but sharp rally in gold and related equities. It is our view that the Fed will be unable to taper because economic activity will remain lethargic indefinitely. We also believe that the robust level of activity required to execute the Fed’s fabled “exit strategy” will remain elusive because the Fed’s strategy of asset purchases suppresses interest rates. Artificial interest rates impede productive economic activity by distorting price signals and misdirecting capital flows. The longer current Fed policies remain in force, the greater the potential disruption to financial markets when it changes, most likely due to events yet unforeseen. Still, conventional economic commentary remains confident of Fed competence to unwind its balance sheet. 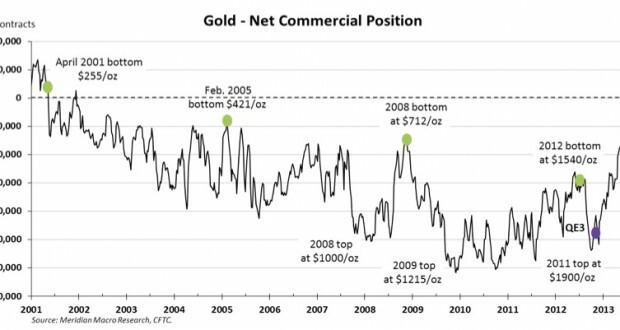 When this confidence dissipates, as we expect, investment demand for gold will resurface in the most forceful manner.